Dogs love walks – but what do you do when your dog loves walks so much that they make it unpleasant for YOU? The problem is, if it’s time for the walk, you probably put the leash on and you take them out. Day by day, your dog is learning that going crazy when it’s time for a walk is a good way to make the walk happen. Pixie and Henny go crazy and out of control, very loud when we try to go for a walk. It’s really hard to get them out the door. What can I do to get them to stop barking carrying on? I’ve tried putting the leashes on and not going anywhere. They eventually calm down but when we want to go on a walk, they go crazy again! Help. This problem is pretty common. It’s generally a sign of some impulse control problems – and perhaps a sign that your dogs need a bit more exercise than their daily walk. If you’re struggling with basic manners and polite greeting behaviors, check out our 29-page e-book on that problem. It will help! There are two main reasons that your dogs go nuts when it’s time for a walk: they don’t know how to get what they want (they’re undertrained) and they need more than just a walk every day (they’re bored). If the walk truly is the highlight of your dog’s day every day, of course he’ll lose his mind when it’s walking time. But if the walk is just another good thing that happens each day, it becomes a bit less exciting to go for a walk. By giving your dog more exercise and mental stimulation, you help decrease their arousal around walks AND help tire them out more every day. I’m a puzzle toy addict – and your dogs should be, too. Throw out your dog’s food bowls. Nina Ottman by Outward Hound Twister Interactive Dog Toy. This puzzle toy is a bit trickier than some others, but it’s perfect for your dog’s kibble every morning. Starmark Bob-A-Lot Toy. This is my absolute favorite sort of toy for dogs with too much energy. This toy rolls around to dispense treats, helping work your dog’s body AND mind. Nylabone Romp-N-Chomp. This toy is a great addition for post-mealtime playtime. I generally give my dog his morning kibble inside of a puzzle toy and hide one of these harder chewtoys for him to find later. By the time I’m home from work, he’s been playing and chewing for ages! Busy Buddy Twist-N-Treat. This toy is best for dogs that like to chomp and owners who use small pieces of kibble. A real challenge, this toy slowly dispenses treats for your dog as he pounces, chases, and chews on its rubbery exterior. Trixie Mad Scientist Toy. I love science, so I love this toy. Put your dog’s kibble into the “test tubes” and watch as he learns to balance (using his core muscles) to paw at the tubes and win his breakfast and dinner! Feeding your dog with puzzle toys, long-lasting chews, and hidden treats will help tire them out and teach them that good stuff happens when they’re not walking, too. I’ve already got a whole blog post about my 13 favorite dog training games. Each of these games will help your dog learn a new skill, tire out your dog’s brain, and even work his body. I particularly recommend trying out #1, the Walking Leave It. This will help teach your dogs that the leash might mean training time, not just walking time. #3, Relax on Your Mat, is even more useful. This game teaches your dogs to just… chill out. I can’t recommend it enough. #5, Red-Light-Green-Light will also help you calm your dogs down around the leashes. Now that your dog is getting more exercise through puzzle toys and learning games, you might already be seeing an improvement in their behavior. But it’s still time to get some training done. Let’s go! Exercise your dogs a bit. Make sure they’re tired. Now grab some treats and just one dog at a time – don’t try to train all three big dogs at once. I use the Blue Buffalo Blue Bits for training – they’re soft and tasty and you can break them in half to really easily control calorie count! Now pick up a leash. If your dog jumps, barks, or spins (or does anything else you don’t like), put the leash back down. As soon as your dog stops spinning, barking, or jumping, toss him a treat. Be quiet and calm – don’t add any extra emotion or excitement to the situation. 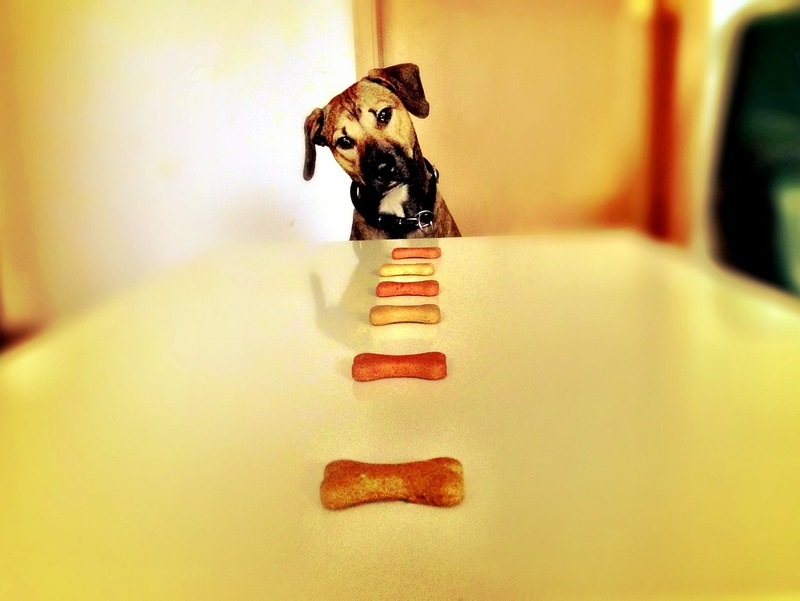 Giving treats to reward the good behavior is really important – otherwise we’re just building frustration in your dog. Repeat this for about two minutes. Then try with the next dog. Over time, you’ll be able to shape your dogs to being more calm when you pick up the leashes. The next time, give your dog a treat if he sits or stands still. Gradually raise criteria and make your dog work a bit harder for the walk. Again, none of this training will work without patience, consistency, and exercise. 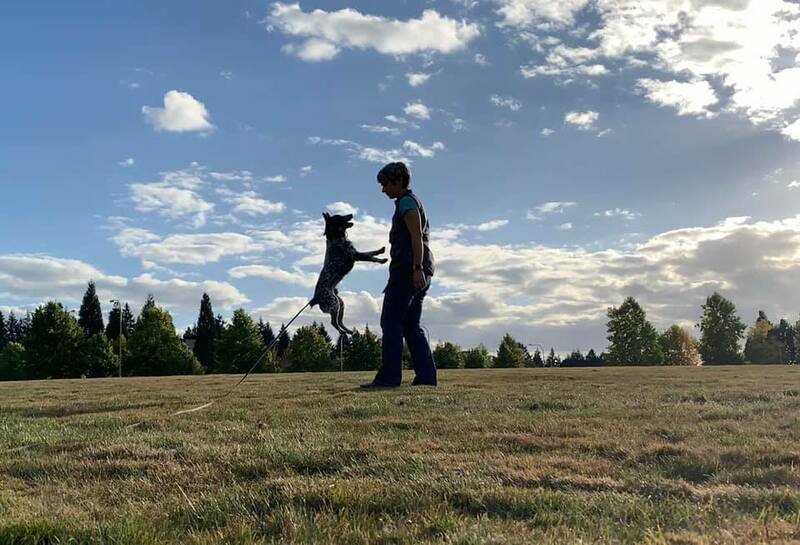 If your dogs are losing their minds because they’re so excited, you need to work on exercise and impulse control before you’re likely to see results with training.